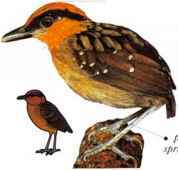 I his large antbird inhabits rain forest undergrowth, moving about in flocks. It regularly follows army ant swarms to prey on other insects fleeing from the ants. • NEST An unlined cup nest, usually in the hollow top of a palm stump. • REMARK Several antbird species have bare skin around the eye. Strikingly marked with "eye spots" (ocellated), this is a large antbird of hare lowland rain forest. 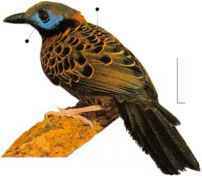 I,ike other birds of eye patch the antbird family, it characteristically feeds by watching the ground for army ant swarms and pouncing on insects flushed out of their hiding places by the ants. 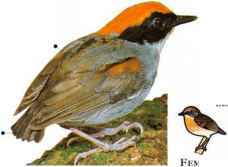 It dominates the smaller antbirds, claiming the lowest perches, so as to have first choice of the insects as they make their escape from the ants. • Distribution Central and South America from Honduras to W. Ecuador. This bird lives in tropical rain forest, also occurring in mature secondary orange • forest (rcgrown after rain forest throat clearance). It feeds mainly by bounding along on the forest floor, catching insects as it goes; it also watches over army ant swarms to prey on insects llushed from cover by the ants. Adapted for life in the undergrowth of rain forests, this bird is also found in mature secondary forest (rcgrown after rain forest clearance). It is usually solitary and stays near the ground, creeping through the vegetation or making brief flights to take insects from the ground and from foliage. Coastal lowlands of E. Brazil.